The website of the local newspaper reported this afternoon that the Bank of America had filed for foreclosure on the Comeau building. No more information right now. This can't be good news. Most likely, this would mean that a hotel conversion, if it's ever going to occur, would certainly be further delayed. The 300 block of Clematis Street is in a state of flux. The central structure on this block is the 10-story Comeau office building, which was one of the original buildings in downtown West Palm Beach, built in the 1920s. The Comeau building still towers above all of the other structures on Clematis Street, as by far the tallest building. In the last year, the Comeau building was sold to a new owner who intends to convert it from an office building into a hotel. At one point, the conversion was scheduled to begin around the beginning of 2009, but that has now been delayed, presumably because the current economic problems are impacting financing for the project. Nevertheless, it appears that when financing is worked out, this building will indeed be converted into a hotel. That will be a great thing for Clematis Street, since there are currently no hotels on Clematis Street or within a few block radius of Clematis Street. Historically, there were numerous hotels along Flagler Drive on the intracoastal, relatively close to Clematis Street, but over time those have all been replaced. 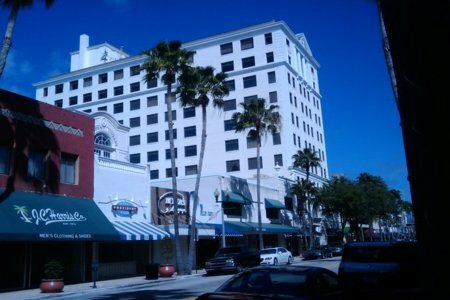 So despite the economic downturn, there is a strong need for hotels in downtown West Palm Beach, and the renovated Comeau building will be a great addition. One of the problems with this plan, however, is the uncertainty created for current tenants and for adjacent businesses, which are currently part of the Comeau building (for instance, Bond's restaurant/nightclub). Just this week, I noticed that Bond's had closed down, and a sign written on white paper on the door stated, "closed for renovation"). This could be good news (i.e. a sign that the hotel renovation is finally going to occur?) or bad news (is Bond's ever going to re-open?). This block has seen its share of changes over the past few years. The closing of Z-Gallerie right across the street from the Comeau building in January was the latest major change. The space that they vacated seems to be generating a lot of buzz. On weekdays, there are often people, possibly investors, looking at the space and discussing possibilities for the space. It would not be surprising to see another business try its hand in that great spot in the near future, especially with the opening of City Center this month on the 400 block. 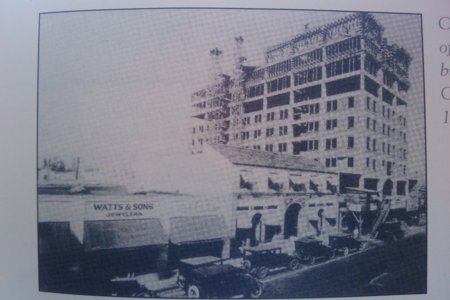 See the interesting comparative pictures below -- first the Comeau building as seen when construction was almost complete in the 1920s (note the type of automobiles seen on the street), and the Comeau building as seen today.